Multi Door Access Control InBio 460 specially designed for offices and enterprises application. InBio controllers install easily on your network and support both TCP/IP and RS-485 communication. 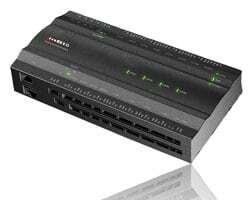 It allows large integrated installations as distance between controllers and RS485 readers can reach up to 800 meters. InBio continues to operate if network connection is interrupted. Data is preserved in on-board SD card if power is lost. It is convenient and safe for users to connect other security products to its groove socket. Web-based management helps to supervise local events on e-map and video remotely in real time control. To purchase this device or for more information like pricing and features please fill the form or call us at 9818390836, 9315441078 WhatsApp 9315441053 or mail us your requirements at info@ampletrails.com Our expert will understand your requirements and will guide you with the right products.